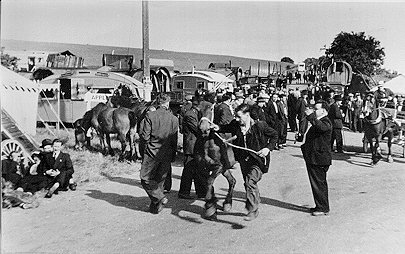 Appleby Horse Fair has existed under the protection of a charter granted by James II since 1685, and has survived an attempt at closure by Westmorland Borough Council in 1965. 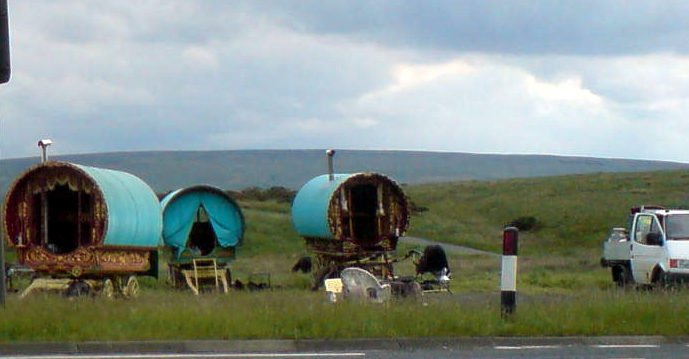 It is one of the key gathering points for the romany, gypsy and travelling community. Superb Fair photographs at this Gallery. The Fair runs from the first Thursday in June (unless this falls on 1 June, in which case the Fair starts on 8 June) to the following Wednesday. Appleby Fair is a unique event, attracting around 10,000 Gypsies and Travellers from across the world and 30,000 other visitors who transform the small market town of Appleby, which normally has a population of 2,500. .
On the Sunday of fair week, between 20,000 and 30,000 visitors pour into Appleby and onto Fair Hill. Details of event can be found on this public services website. Tourists also mingle with the travellers to watch horses being washed in the river and the sometimes dangerous galloping and trotting of horses to show them off to potential buyers. Some shops close down for the duration as normal life is disrupted by the annual tradition. Superb Fair photographs at this Gallery. Interesting pages on gypsy culture and history from Liverpool University.